"Paray is heard at his best in French music..."
Although these two recordings were made very close together in the month of December, 1953, one suspects that someone involved in the second sessions might have been suffering from a little too much post-Christmas cheer. Sonically there was little to question of the first album, consisting of the Ravel, first Fauré and Franck and recorded on the 7th December; XR remastering brought a few minor tweaks to the sound which helped make it a little more realistic than one often hears from Mercury recordings of this era. However the second album here, the Dukas, second Fauré and Roussel, recorded between 26th and 28th December 1953 was an entirely different matter. Despite another excellent transfer of a near-mint LP original, the sound of the orchestra was quite bizarre, and it's hard to believe nobody noticed this at the time. Of course with modern computer tonal analysis, as carried out with all XR remasters, it's easy to see precisely what the problem is - a graph showing the average tonal spectrum of the entire album indicates a deep trough at just above 1kHz followed by a very unnatural lift centred around 3.4kHz. There were other oddities as well, but these two were the main culprits, and it suggests that someone in the recording or mastering chain someone did something very unusual with the tone controls. In 1999, I took a trip to Detroit. While my purpose was to experience a game at Tiger Stadium before it was too late, I also made a sort of pilgrimage to the recording venues used by the Detroit Symphony Orchestra when it recorded for Mercury. If I could have found it, I would have looked at the United Artists Theater, where Antal Doráti’s London recordings were made. Parking problems and the likelihood that I couldn’t get in, anyway, discouraged me from doing anything more than a drive-by look, but I saw the Masonic Temple, the Ford Auditorium, Cass Technical High School, and, finally, the DSO’s present home, Orchestra Hall, built in 1918, abandoned in 1939 when the orchestra lost its lease, and eventually saved by determined citizens after the city condemned it. Wilma Cozart, who was involved in the production of Mercury’s Detroit recordings, told me that when Mercury moved its activities there after the Ford Auditorium proved to be unsatisfactory, she could see the sky through a hole in the roof! Once the building had been condemned, Mercury made Paul Paray’s final batch of recordings at the auditorium of Cass Technical High School. 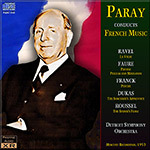 Although the annotations claim that some folks touted the DSO as the world’s greatest “French” orchestra during Paul Paray’s tenure, it didn’t sound particularly French to me—more like a very good American orchestra, which it was and is. Paray, it is true, recorded a lot of French music, but he also made perfectly good recordings of music by, among others, Beethoven, Brahms, Schumann, and Wagner. During one of the early sessions, a take was ruined by a mysterious tapping sound. Mercury’s team eventually discovered that the problem was that the conductor was tapping his feet in time to the music. From then on, Paray wore slippers while recording! With one exception, all the pieces on this CD were recorded only monaurally; the one that was redone in stereo was La Valse. This is the mono version. Paray’s energetic, vigorous approach to the music suggests that he doesn’t see the piece as an allusion to the collapse of decadent European civilization (which is a possible way of interpreting it) but a brilliantly orchestrated showpiece for a virtuoso orchestra and conductor (the way most conductors seem to interpret it). It obviously gave Mercury’s team an opportunity to show off its technique, too. Given technical competence, La Valse cannot fail in concert. It’s pretty hard to ruin the melancholy but stately Fauré Pavane, too. Fauré wrote the piece for orchestra and chorus but specified that the vocal parts could be eliminated, an option that I suspect most conductors exercise, as does Paray, who does not dawdle over it. Paray’s performance of three of the orchestral sections of Franck’s Psyché shows a (to me) gentler side to the conductor, who struck me as more drawn to energy and power in his performances. The orchestra’s strings sing here and Paray seems to have considerable affection for what must be Franck’s most sensuous music. Unfortunately, he didn’t have enough affection to include the movement called “The Garden of Eros,” or perhaps it was believed that there wasn’t enough space on the LP. I might point out, though, that Eduard van Beinum’s more-or-less contemporaneous recording includes all four movements on one side of an LP; it’s also a lovely performance and has a richer sonority than Paray’s. Paray seems to relish The Sorcerer’s Apprentice but more for its possibilities as an orchestral showpiece than its quirkiness, and on that level the performance is certainly a success. The clear, powerful recording helps, too. Paray’s approach to the Pelléas and Mélisande excerpts is refined and, mainly, unsentimental. The symphonic fragments from The Spider’s Feast are right up his alley (a pity he didn’t record the complete score), giving the music an edge that it sometimes lacks in other performances. I wonder what he might have done with the symphonies. This article originally appeared in Issue 34:4 (Mar/Apr 2011) of Fanfare Magazine.